We’re all well aware that 2016 is the 50th anniversary of Star Trek. But beyond just Star Trek Beyond, there are several other major celebrations planned. One that starts during San Diego Comic-Con is a 50-artist traveling exhibit that includes Leonard Nimoy’s final piece of work. 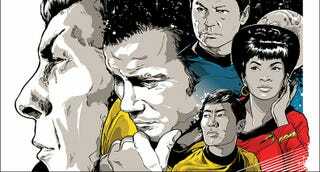 Called Star Trek: 50 Years, 50 Artists, it’ll open on July 21 at Michael J. Wolf Fine Arts in San Diego, CA. From there, it’ll end up in Las Vegas, Toronto, and the UK. The official Star Trek site is slowly revealing all the pieces and here are the first few, including the final work of Spock himself. For more on the Nimoy piece, head to Mashable, which has a nice write up. There are also a few more that have been revealed. Check them out. That’s just five of the 50 pieces in the show. For more reveals, more information about the art show, and the concerts, conventions, and more that are helping celebrate 50 years of Trek, visit the official site.